Hmmm, that house looks familiar ;) For the LePage birdhouse challenge, I needed to build a house that represented me or my city so I started with a traditional red brick structure. And what can be more Toronto-esque then putting a modern addition on the back of that trad home? A comment by Kelly on this post got me thinking about blending the historic and modern. Thanks Kelly for the inspiration! The main house has room for a few birds and so does the addition. I used the upper deck to store some birdseed. To give a sense of the city, I mounted the birdhouse on a long board and added silhouettes of the city skyline in the distance. I have no clue how they will actually mount this birdhouse (all the birdhouses will be installed at the 2000th Habitat for Humanity Canada house in Winnipeg) - but at least its pretty, ha! On to the details... LePage Products provided the birdhouse structure which HandyMan assembled for me. Then I applied some free printable brick wallpaper (more typically used for dollhouses) using Outdoor Mod Podge. I created roof shingles using wooden shims cut down to size and added some model trim from Michaels and mini flower pots (filled with real forget-me-nots). A flag/perch was created with a dowel and a flag I made in Photoshop. I also found a little wooden box at Michaels which proved to be a treasure trove... the mesh top was used to make faux stained glass windows, the box hinges were used as hinges for the doors on the addition, and one of the screws was used as the front doorknob. HandyMan made the structure for the addition and I covered it with flat wooden sticks to mimic the look of siding. 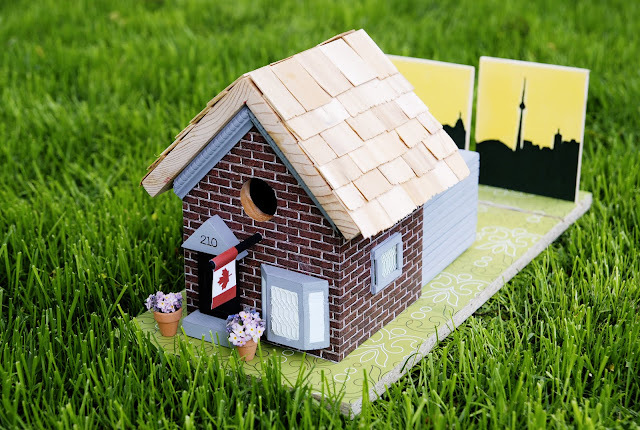 We added a second bird hole in the addition, making this a multi-apartment abode :) Scrapbook paper mod podged to the board creates a modern grassy base. So that is my Birdhouse In The City. Is it good enough to beat Sarah and Mike? I'm not sure, but I'd love for you to vote for it by "liking" it when it appears on the LePage Products Facebook page later this week! In the meantime, there is a little girl here who is very disappointed she doesn't get to keep this birdhouse. Guess I'll have to get cracking on a replacement. It looks amazing!!! I adore all the little details, like the windows, the doorknob, the siding, it's all amazing!! You did a fantastic job!